It used to be that a cruising expedition in the Amazon Rainforest required not just a sense of adventure, but also the ability to ‘rough it’ on ships that had seen much better days. 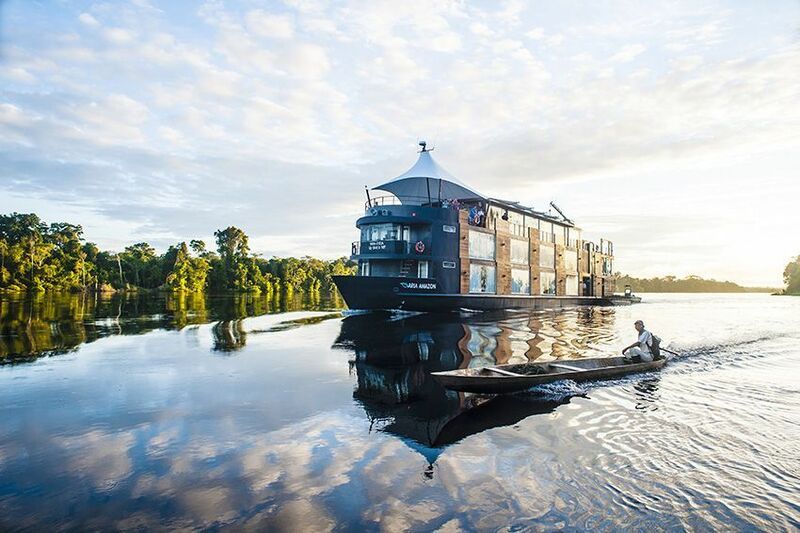 But now - with new ships featuring all the mod cons seemingly being launched every year - you can still have all the adventure of an Amazon expedition, whilst travelling on some of the most stylish small ships in the world. 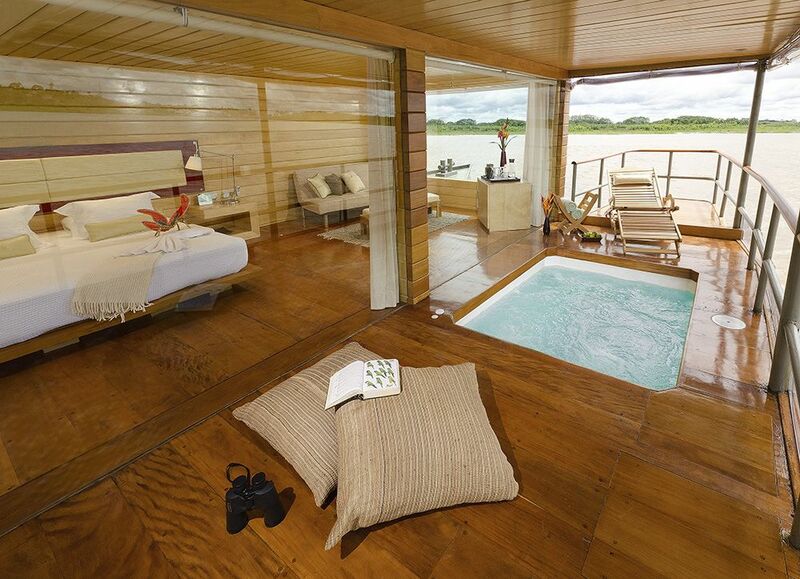 So, we got to thinking about which of these ships offers the most spectacular suites that will leave you picking your jaw up from the floor whilst simultaneously adding an Amazon expedition to your travel bucket list! We’ve done all the hard work for you and narrowed down the choices to rank what we think are the three most opulent suites on the Amazon today. Here’s our countdown – be warned though, the WOW factor is high! 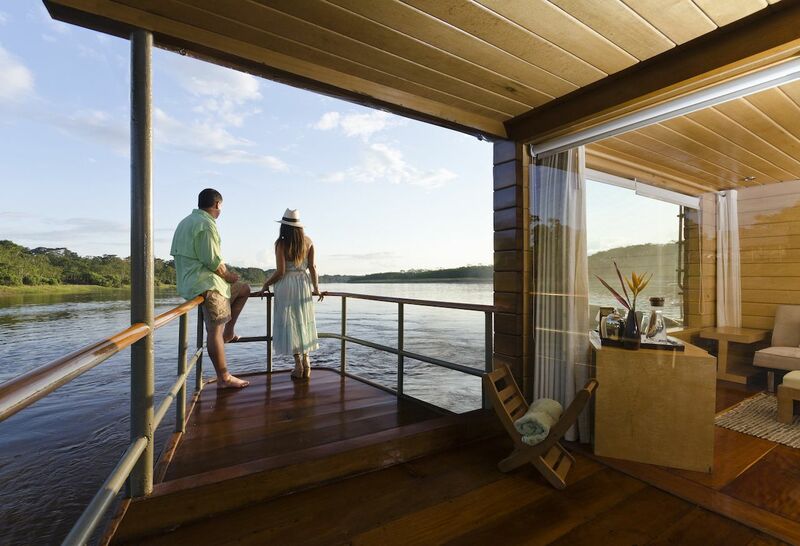 Designed by the innovative Peruvian architect Jordi Puig, all 16 Design Suites on the Aria Amazon measure a spacious 23 square metres (250 square feet), meaning there’s plenty of room to sit back and relax. 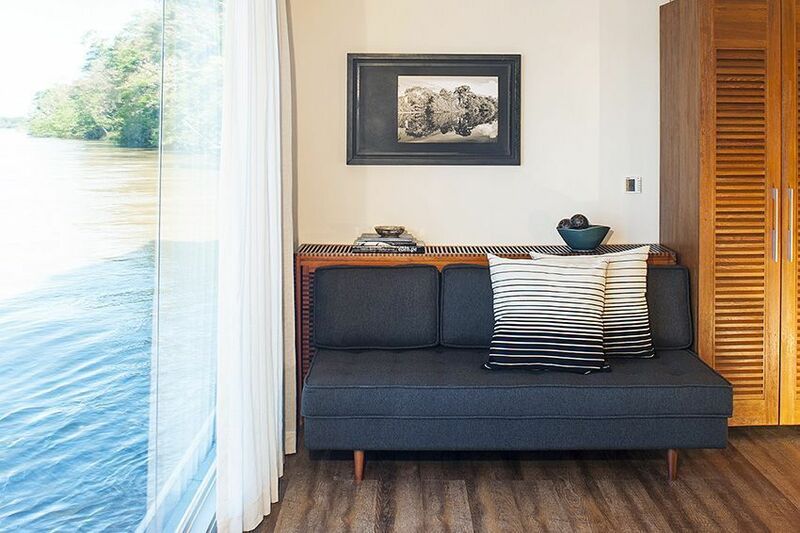 Floor to ceiling windows offer uninterrupted viewing of the passing river scenery, polished timber flooring adds to the ambience and of course each suite has individually controlled air-con. 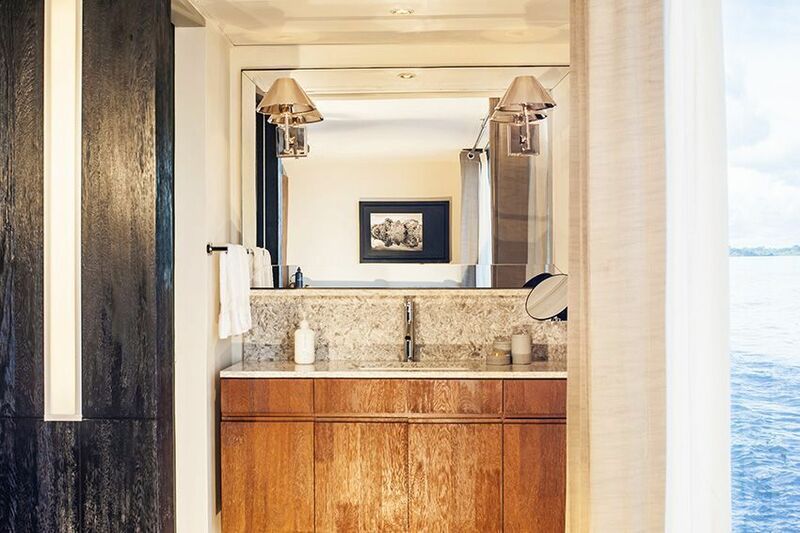 The en suite bathrooms feature a rain shower and luxurious, organic bath amenities incorporating the latest eco-sensitive technology. Soft lighting, natural fibres and neutral hues create a relaxing and luxuriously comfortable enclave where one’s only challenge may be to decide whether to gaze upon the Amazon from atop the California king size bed, dressed with 100% Peruvian cotton high thread count sheets or while lounging on the cozy window-side day bed, binoculars in hand. 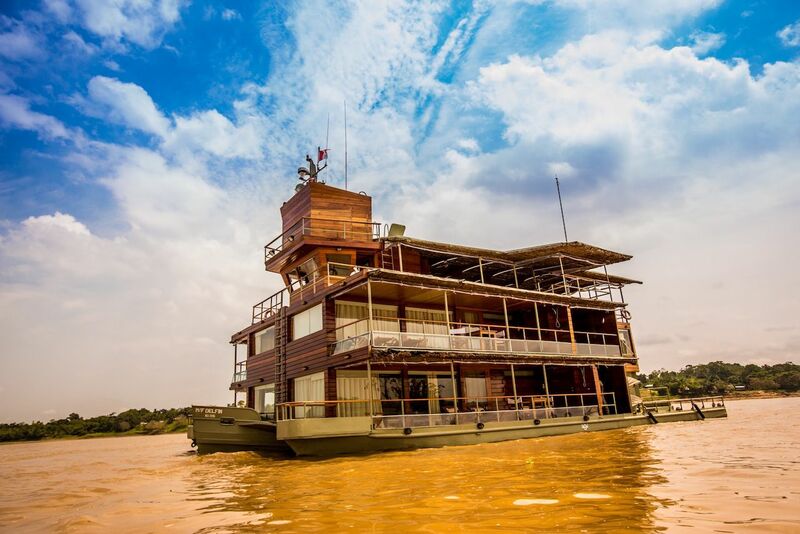 The 43-guest Delfin III (formerly Amazon Discovery) was launched in October 2015 - making it the newest ship operating in Peru's Pacaya Samiria National Reserve. 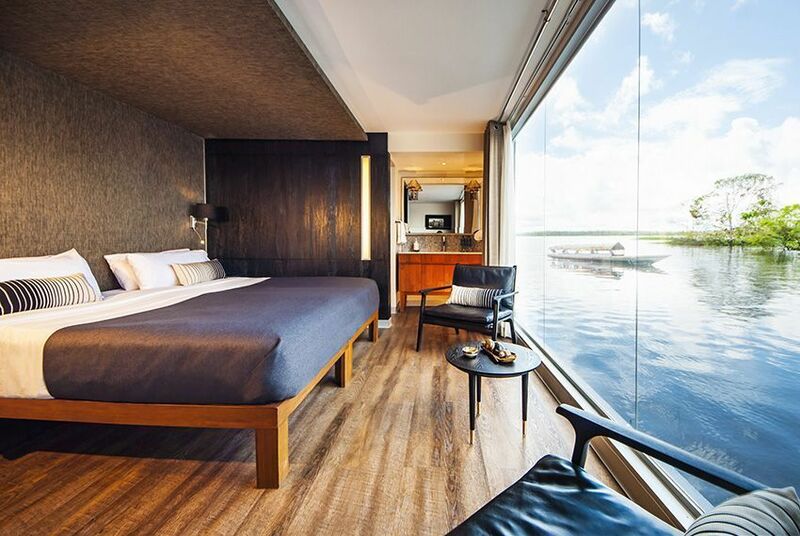 The single Amazonia Suite is the ship’s most sought-after room, and at 55 square metres (597 square feet) it’s larger than some of the apartments I’ve lived in! 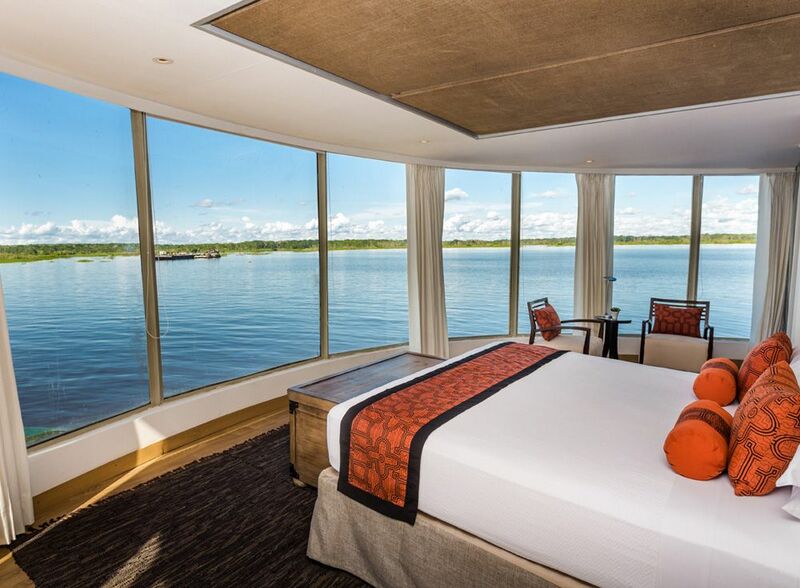 Located on the second deck at the front of the ship, those lucky enough to call it home during their expedition will enjoy breathtaking views of the river and rainforest through forward-facing 180 degree floor to ceiling windows. 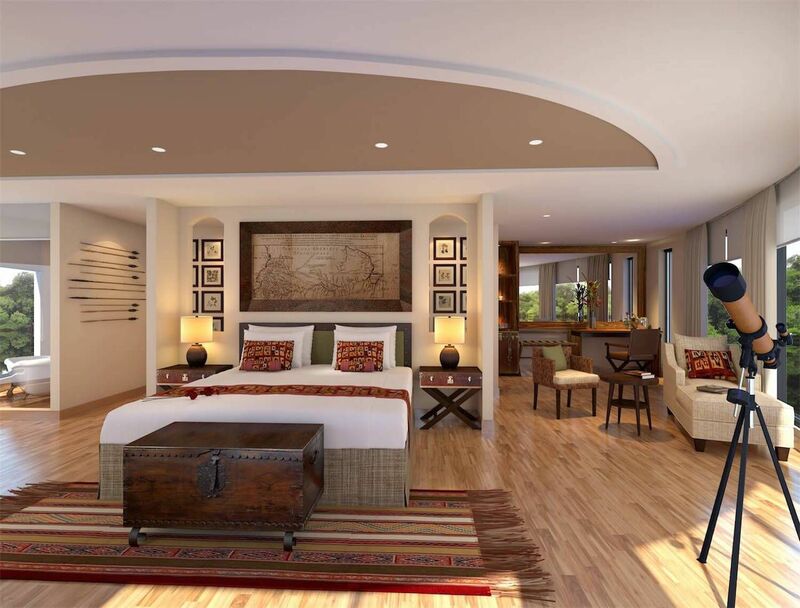 Awaken to a breathtaking vista from the comfy bed, complete with luxurious Peruvian linens and European duvet. A cosy sofa is positioned to allow for reading, whilst keeping a close eye on the passing scenery. A standalone bathtub really turns up the feeling of luxury. 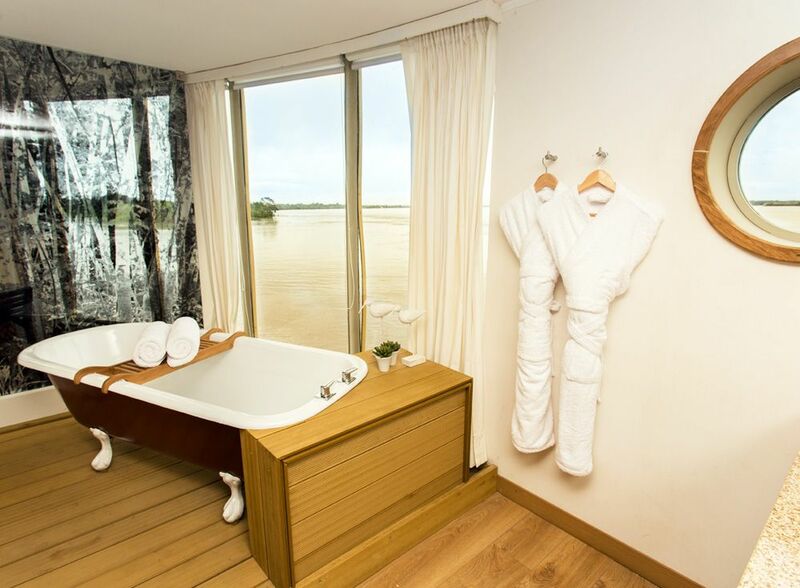 But that’s not all; guests will also receive a complimentary 60-minute spa treatment, a fully-stocked mini bar and laundry services during the expedition. For several years now it’s been our favourite Amazon suite, and even with the arrival of some new contenders we still think Delfin I’s Deluxe Suite has more WOW factor than any of its nearest rivals. With interior space measuring 34 square metres (360 square feet), there is plenty of space to enjoy, even before you consider the additional 32 square metres on the private terrace. 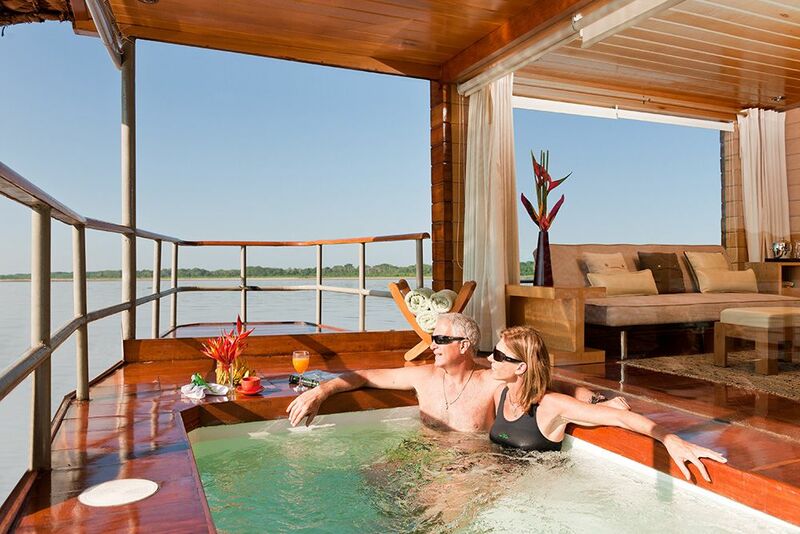 The cool water plunge pool is a real jaw-dropper and makes Delfin I the first and only river vessel with this luxurious feature. Located on the main deck, the two spacious Deluxe Suites feature a king size bed that are wrapped by 180° panoramic windows stretching from floor to ceiling, a mini bar, in-suite seating area with a sofa bed, fine Peruvian cotton linens, environmentally friendly amenities, silent A/C units, hot water, hair dryer, safe deposit box and internal communications system. Even if you’re a top-of-the-tree loyalty club member with a particular cruiseline, make sure you don’t lock yourself in before doing the proper research. You’ll need to consider things such as tides and sea conditions to work out which ship best suits the destination. And don’t overlook smaller, local operators (rather than the major international lines), often they will have quite a few secret spots up their sleeves that the biggies don’t know about. 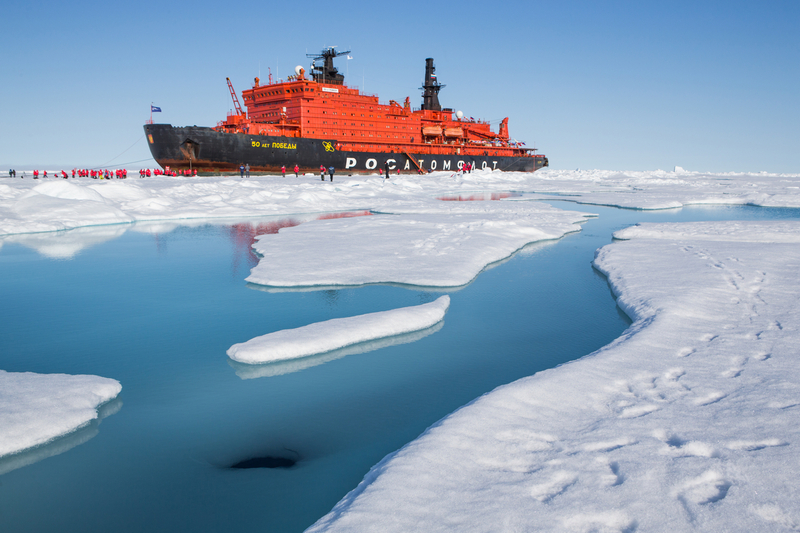 Some choices are obvious; if it’s your ambition to reach 90 degrees north (otherwise known as the North Pole), then a powerful icebreaker will be your best bet. Other times the answer won’t be so simple and will require a bit of investigation. Tides (yes really). Australia’s Kimberley Coast - one of the world’s hottest destinations for expedition cruisers - is renowned for its 13-metre tides (that’s over 40 feet!) 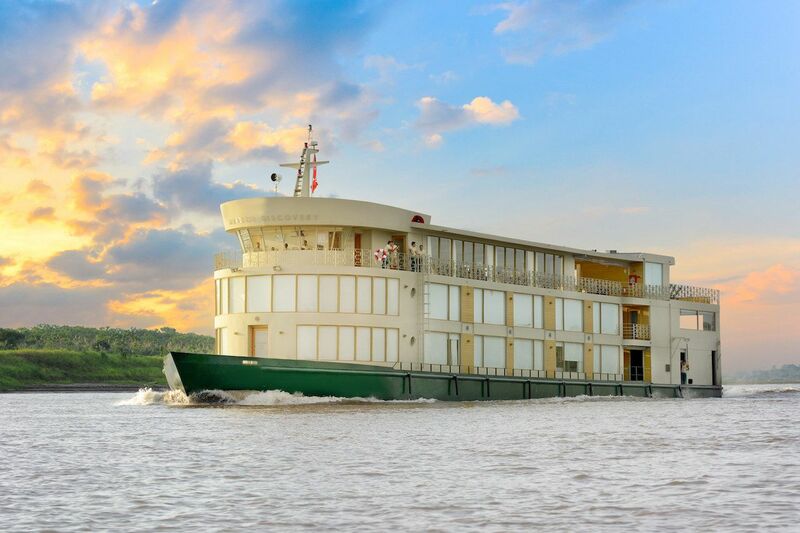 governing access to rivers and tributaries, meaning that larger expedition ships offer more restricted itineraries than their smaller counterparts with shallower drafts. An expedition that includes a lot of open-water steaming will be more comfortable on a larger ship, and definitely one with active stabilisers. Areas of the Drake Passage and Southern Ocean (for Antarctic expeditions) can be really hairy, and a bigger ship will offer a more comfortable crossing – just make sure it doesn’t have more than 100 guests though (see below). If your preferred itinerary requires several ‘days at sea’ make sure your ship has enough in the way of entertainment or lectures to keep you amused on those days. When cruising in the polar regions make sure the ship has individually-controlled heating so you can ‘set and forget’ your own comfortable cabin temperature (also applies in reverse for the tropics). Sure, bigger expedition ships are likely to offer more onboard dining and entertainment options, but sometimes more passengers can also hinder exploration. If you’re headed for Antarctica be aware that only 100 people are allowed to land in the same place at any one time. If you’re on a small ship of up to 100 passengers, then you get a chance to go ashore every time. If the ship is larger, sometimes you might miss out as others have ‘their turn’. I know that would annoy me - so make sure you pick a ship that limits its passenger numbers to under 100 when travelling to Antarctica - even if it normally accommodates more. Have a good look at the promotional photos issued by the cruiseline to get a feel for the demographics of their typical client. If you’re an active adventurer always champing at the bit to put on your shoes for a long hike, you might be disappointed if the activity levels are toned right down to cater for a not so young-at-heart clientele. Checking out photos from previous expeditions - and reviews on sites such as www.cruisecritic.com - will give you a good idea of what to expect. Zodiacs (heavy-duty inflatable dinghies) are the mainstay of the expedition cruise industry, but make sure your ship of choice has enough of them to be able to move travellers quickly! 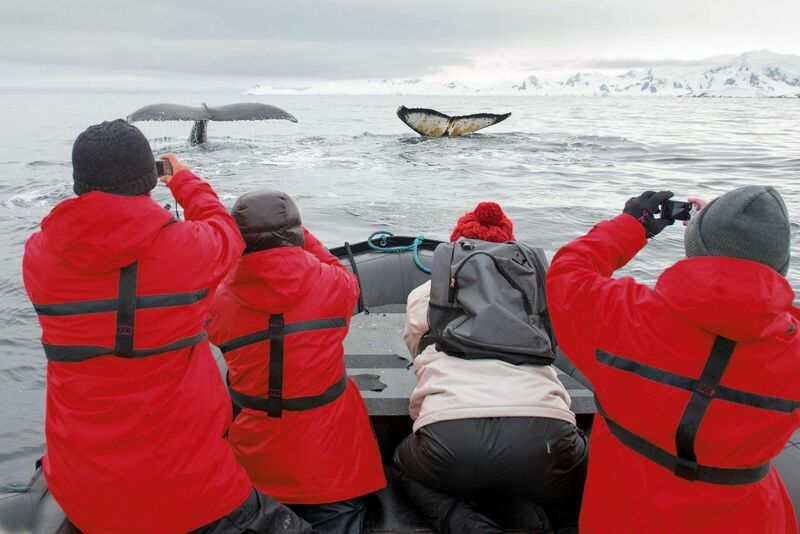 You don’t want to be sitting on board waiting for your turn to be ferried ashore while others are in the midst of a once-in-a-lifetime wildlife encounter. Some cruiselines have come up with ingenious inventions to move guests quickly and it’s also worth considering whether the ship offers use of kayaks, paddleboards, bicycles and other expedition equipment to allow you to get out and explore at your own pace. The best expedition teams can turn a good expedition into a life-changing journey. Not only are they responsible for ensuring day to day plans go off without a hitch, they will also be behind the scenes solving dramas (weather, technical malfunctions, unhappy locals) before you even know about them. Typically, the best expedition leaders spend their time working in one region - Alaska is a good example - which they know like the back of their hand, rather than following a ship on its annual schedule all around the world. Also keep an eye out for guest lecturers, resident photographers and other experts joining an expedition team - they can really add a new dimension to the experience. 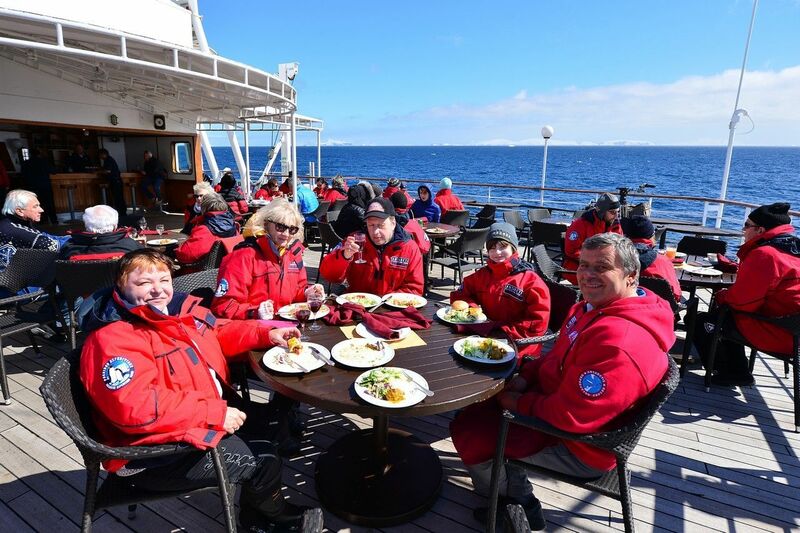 Most importantly, don’t be afraid to ask for more details about the expedition team - most cruiselines will be more than happy to provide you with their bios ahead of time. So there you go - our five top tips to consider in choosing a ship for your next expedition. Contact our expedition specialists for more expert advice and top tips! We're excited to launch our new website www.expeditioncruisespecialists.com and we hope you love it as much as we do! It's been a very busy few months working with our web developers, and hand-picking all the product we think represents the world's best expedition and small ship cruises. Over coming days and weeks we'll be continuing to load more exciting expeditions, and if there is an expedition you think we've missed - maybe you've done it yourself - please be sure to shoot us a note and tell us why it should be added to our portfolio! We hope you enjoy browsing the site and that it provides some great inspiration for your next expedition cruise. Of course you can reach our expedition specialists during business hours on freecall 1800 90 20 80 (within Australia), Skype (from the homepage) or by email on [email protected] - we're waiting to help you plan your next dream holiday.